The mining and metallurgy industry holds an important role in the prosperity of several cities and regions around the globe. Confronted with numerous challenges such as competition and innovation, they must constantly invest in research and development, reduce manufacturing costs and find ways to reduce their environmental footprint. Companies in mining and metallurgy, and mineral processing look for qualified suppliers of high quality, specialized equipment. 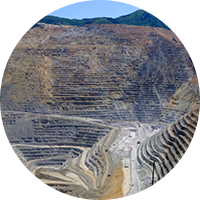 Laval Lab has over 30 years of experience offering products and services to the mining industry. We have the expertise, and the range of scientific laboratory equipment, to actively participate in projects for the mining industry as well as mineral processing and metallurgical testing laboratories. Our experienced representatives work in close collaboration with the project manager to offer the best value for performance solutions. Our supplier base is extensive, comprising of manufacturers that set the standard in their domain. We offer a complete range of high quality laboratory testing and sample preparation equipment. Including the crushers and grinders required for milling the sample, sample dividers and sieve shakers for particle size analysis, and sample preparation equipment for XRF analysis, Laval Lab also offers a complete line of accessories and complementary products and services that might be required during the installation and production phases. Our representative offers technical support for the life of the instrument. Laval Lab understands the requirements and complexities in the mining industry and mineral processing laboratories. From the first contact, our qualified representatives ask pertinent questions so there is a clear understanding of what is required. For each project, we work closely with your engineering consultants and company personnel to offer made-to-measure solutions. The Laval Lab representative is your resource for information during planning and purchasing, and their support continues during installation, training and after-sale service. We work together with our clients in mining, metallurgy and mineral processing, to deliver quality solutions. We are aware that the industries of mining and metallurgy require equipment that is innovative and achieves high standards, that’s why Laval Lab is the essential reference for these products and services. Access to world-renowned manufacturers .